THE KILLERS ROLLED slowly down the narrow alley, three men jammed onto a single motorcycle. It was a little after 11 am on July 31, 2013, the sun beating down on the low, modest residential buildings lining a back street in the Indian farming village of Raipur. Faint smells of cooking spices, dust, and sewage seasoned the air. The men stopped the bike in front of the orange door of a two-story brick-and-plaster house. Two of them dismounted, eased open the unlocked door, and slipped into the darkened bedroom on the other side. White kerchiefs covered their lower faces. One of them carried a pistol. Inside the bedroom Paleram Chauhan, a 52-year-old farmer, was napping after an early lunch. In the next room, his wife and daughter-in-law were cleaning up while Paleram’s son played with his own 3-year-old boy. Gunshots thundered through the house. Preeti Chauhan, Paleram’s daughter-in-law, rushed into Paleram’s room, her husband, Ravindra, right behind her. Through the open door, they saw the killers jump back on their bike and roar away. Paleram lay on his bed, blood bubbling out of his stomach, neck, and head. “He was trying to speak, but he couldn’t,” Preeti says, her voice breaking with tears. Ravindra borrowed a neighbor’s car and rushed his father to a hospital, but it was too late. Paleram was dead on arrival. Despite the masks, the family had no doubts about who was behind the killing. For 10 years Paleram had been campaigning to get local authorities to shut down a powerful gang of criminals headquartered in Raipur. The “mafia,” as people called them, had for years been robbing the village of a coveted natural resource, one of the most sought-after commodities of the 21st century: sand. That’s right. Paleram Chauhan was killed over sand. And he wasn’t the first, or the last. OUR CIVILIZATION IS literally built on sand. People have used it for construction since at least the time of the ancient Egyptians. In the 15th century, an Italian artisan figured out how to turn sand into transparent glass, which made possible the microscopes, telescopes, and other technologies that helped drive the Renaissance’s scientific revolution (also, affordable windows). Sand of various kinds is an essential ingredient in detergents, cosmetics, toothpaste, solar panels, silicon chips, and especially buildings; every concrete structure is basically tons of sand glued together with cement. Indian workers wash stone before it gets crushed into sand at an Illegal mine near Raipur Village. In some places multinational companies dredge it up with massive machines; in others local people haul it away with shovels and pickup trucks. As land quarries and riverbeds become tapped out, sand miners are turning to the seas, where thousands of ships now vacuum up huge amounts of the stuff from the ocean floor. As you might expect, all this often wreaks havoc on rivers, deltas, and marine ecosystems. Sand mines in the US are blamed for beach erosion, water and air pollution, and other ills, from the California coast to Wisconsin’s lakes. India’s Supreme Court recently warned that riparian sand mining is undermining bridges and disrupting ecosystems all over the country, slaughtering fish and birds. But regulations are scant and the will to enforce them even more so, especially in the developing world. Sand mining has erased two dozen Indonesian islands since 2005. The stuff of those islands mostly ended up in Singapore, which needs titanic amounts to continue its program of artificially adding territory by reclaiming land from the sea. The city-state has created an extra 130 square kilometers in the past 40 years and is still adding more, making it by far the world’s largest sand importer. The collateral environmental damage has been so extreme that Indonesia, Malaysia, and Vietnam have all banned exports of sand to Singapore. All of that has spawned a worldwide boom in illegal sand mining. On Indonesia’s island of Bali, far inland from the tourist beaches, I visit a sand mining area. It looks like Shangri-la after a meteor strike. Smack in the middle of a beautiful valley winding between verdant mountains, surrounded by jungle and rice paddies, is a raggedy 14-acre black pit of exposed sand and rock. On its floor, men in shorts and flip-flops wield sledgehammers and shovels to load sand and gravel into clattering, smoke-belching sorting machines. “Those who have permits to dig for sand have to pay for land restoration,” says Nyoman Sadra, a former member of the regional legislature. “But 70 percent of the sand miners have no permits.” Even companies with permits spread bribes around so they can get away with digging pits wider or deeper than they’re allowed to. Today criminal gangs in an estimated 70 countries, from Jamaica to Nigeria, dredge up tons of the stuff every year to sell on the black market. Half the sand used for construction in Morocco is estimated to be mined illegally; whole stretches of beach there are disappearing. One of Israel’s most notorious gangsters, a man allegedly involved in a spate of recent car bombings, got his start stealing sand from public beaches. Dozens of Malaysian officials were charged in 2010 with accepting bribes and sexual favors in exchange for allowing illegally mined sand to be smuggled into Singapore. But nowhere is the struggle for sand more ferocious than in India. Battles among and against “sand mafias” there have reportedly killed hundreds of people in recent years—including police officers, government officials, and ordinary people like Paleram Chauhan. THE AREA AROUND Raipur used to be mostly agricultural—wheat and vegetables growing in the Yamuna River floodplain. But Delhi, less than an hour’s drive north, is encroaching fast. Driving down a new six-lane expressway that cuts through Gautam Budh Nagar, the district in which Raipur sits, I pass construction site after construction site, new glass and cement towers sprouting skyward like the opening credits from Game of Thrones made real across miles of Indian countryside. Besides countless generic shopping malls, apartment blocks, and office towers, a 5,000-acre “Sports City” is under construction, including several stadiums and a Formula 1 racetrack. The Chauhan family has lived in the area for centuries, Paleram’s son Aakash tells me. He’s a slim young guy with wide brown eyes and receding black hair, wearing jeans, a grey sweatshirt, and flip-flops. We’re sitting on plastic chairs set on the bare concrete floor of the family’s living room, just a few yards from where his father was killed. The family owns about 10 acres of land, and shares some 200 acres of communal land with the village—or used to. About 10 years ago a group of local “musclemen,” as Aakash calls them, led by Rajpal Chauhan (no relation—it’s a common surname) and his three sons, seized control of the communal land. They stripped away its topsoil and started digging up the sand built up by centuries of the Yamuna’s floods. To make matters worse, the dust kicked up by the operation stunted the growth of surrounding crops. As a member of the village panchayat, or governing council, Paleram took the lead in a campaign to get the sand mine shut down. It should have been pretty straightforward. Aside from stealing the village’s land, sand mining is not permitted in the Raipur area at all because it’s close to a bird sanctuary. And the government knows it’s happening: In 2013 a fact-finding team from the federal Ministry of Environment and Forests found “rampant, unscientific, and illegal mining” all over Gautam Budh Nagar. Nonetheless, Paleram and other villagers couldn’t get it stopped. They petitioned police, government officials, and courts for years—and nothing happened. The conventional wisdom says that many local authorities accept bribes from the sand miners to stay out of their business—and not infrequently, are involved in the business themselves. For those who don’t take the carrot of a bribe, the mafias aren’t shy about using a stick. 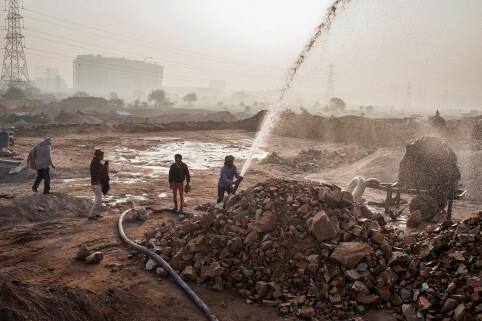 “We do conduct raids on the illegal sand miners,” says Navin Das, the official in charge of mining in Gautam Budh Nagar. “But it’s very difficult because we get attacked and shot at.” In the past three years, sand miners have killed at least two police officers and attacked many others, as well as government officials and whistle-blowers. Just this March, soon after I returned from India, an assault by illegal sand miners put a television journalist in the hospital. According to court documents, Rajpal and his sons threatened Paleram and his family as well as other villagers. Aakash knows one of the sons, Sonu, from when they were kids in school together. “He used to be a decent guy,” Aakash says. “But when he got into the sand business and started making fast money, he developed a criminal mentality and became very aggressive.” Finally, in the spring of 2013, police arrested Sonu and impounded some of his outfit’s trucks. He was soon out on bail, though. One morning Paleram rode his bicycle out to his fields, which are right next to the sand mine, and ran into Sonu. “He said, ‘It’s your fault I was in jail,’” according to Aakash. “He told my father to drop the issue.” Instead Paleram complained to the police again. A few days later, he was shot dead. Sonu, his brother Kuldeep, and his father, Rajpal, were arrested for the killing. All of them are currently out on bail. Aakash sees them around sometimes. “It’s a small village,” he says. THE BROAD, MURKY Thane Creek, just outside Mumbai, is swarmed with small wooden boats on a recent February morning. Hundreds of them are anchored together, hull to hull, in a ragged line stretching at least half a mile. The river’s banks are lined with green mangroves, towered over by apartment blocks. There’s a faint tang of salt in the air from the nearby Arabian Sea, mixed with diesel from the boats’ engines. Each boat carries a crew of six to 10 men. One or two of them dive down to the river bottom, fill a metal bucket with sand, and return to the surface, water streaming from their black hair and mustaches. Then two others, standing barefoot on planks jutting from the boat, haul up the bucket with ropes. Their lean, muscular physiques would be the envy of any hipster gym rat if they weren’t so hard-earned. The next day Sumaira Abdulali, India’s foremost campaigner against illegal sand mining, takes me to see a different kind of mine. Abdulali is a decorous, well-heeled member of the Mumbai bourgeoisie, gentle of voice and genteel of manner. For years she has been traveling to remote areas in a leather-upholstered, chauffeur-driven sedan, snapping pictures of sand mafias at work. In the process she’s been insulted, threatened, pelted with rocks, pursued at high speeds, had her car windows smashed, and been punched hard enough to break a tooth. Soon after, back on a main road, we find ourselves behind a small convoy of three sand trucks. They rumble, unmolested, past a police van parked on the side of the road. A couple of cops idle next to it, watching the traffic going by. Another is inside taking a nap, his seat fully reclined. This is too much for Abdulali. We pull up alongside the van. An officer who appears to be in charge is lounging inside, wearing a khaki uniform, with stars on his shoulders and black socks on his feet. He has taken his shoes off. “Didn’t you see those trucks carrying sand that just went past?” Abdulali asks. BACK IN RAIPUR, after I finish talking with Paleram Chauhan’s family, his son Aakash agrees to show me and my interpreter, Kumar Sambhav, the village lands where the mafia has taken over. We’d rented a car in Delhi that morning, and Aakash directs our driver to the site. It’s hard to miss: Right across the road from the village center is an expanse of torn-up land pocked with craters 10 and 20 feet deep, stippled with house-sized piles of sand and rock. Here and there trucks and earth-moving machines rumble around, and clusters of men, at least 50 all told, are smashing up rocks with hammers and loading up trucks with shovelfuls of sand. They stop to stare at our car as we drive slowly past on the rutted dirt track running through the mine. Aakash cautiously points out a tall, heavyset guy in jeans and a collared shirt: Sonu. A short while later, deep inside the site, we get out to snap pictures of a particularly huge crater. After a few minutes Aakash spots four men, three of them carrying shovels, striding purposefully toward us. “Sonu is coming,” he mutters. Aakash keeps silent. Sambhav mumbles something to the effect that we’re just tourists, as we all climb into the car. “I’ll give you sisterfuckers a tour,” Sonu says. He yanks open our driver’s door and orders him out. The driver obeys, obliging the rest of us to follow suit. Aakash, wisely, stays put. “We saw whatever we saw. And now we’re leaving.”“No, you’re not,” Sonu says. The exchange continues along those lines for a couple of increasingly tense minutes, until one of Sonu’s goons points out the presence of a foreigner—me. This gives Sonu and his crew pause. Harming a Westerner like me would bring them a lot more trouble than going after a local like Aakash. We grab the opportunity to get back in the car and take off. Sonu, glaring, watches us go. At the mine, four men stride toward us. One of them is a man Aakash Chauhan thinks killed his father. “Sonu is coming,” Chauhan mutters. Aakash keeps in touch with police investigators and has tried to get the Indian People’s Tribunal to take an interest. His mother pleads with him to drop the whole thing, especially since her other son, Aakash’s brother, Ravindra—who was to have been the main witness in the case—was found dead by some railroad tracks last year, apparently run over by a train. No one is sure how that happened. But India is a vast country of more than 1 billion people. It hides hundreds, most likely thousands, of illegal sand mining operations. Corruption and violence will stymie many of even the best-intentioned attempts to crack down. At root, it’s an issue of supply and demand. The supply of sand that can be mined sustainably is finite. But the demand for it is not. Every day the world’s population is growing. More and more people in India—and everywhere else—want decent housing to live in, offices and factories to work in, malls to shop in, and roads to connect it all. Economic development as it has historically been understood requires concrete and glass. It requires sand. This entry was posted on Thursday, March 26th, 2015 at 8:06 am and is filed under Uncategorized. You can follow any responses to this entry through the RSS 2.0 feed. You can leave a response, or trackback from your own site.